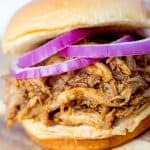 This Instant Pot shredded chicken is full-flavored, easy to make, and has the most amazing homemade BBQ sauce that's sweet with just a hint of spice. Add onions, garlic, and bay leaf to pot. Place trivet on top of aromatics. Then add 1 cup of water. Season chicken liberally with salt and pepper, including inside cavity. Place chicken (breast side up) on top of trivet. Lock lid and cook for 45 minutes at high pressure. Meanwhile… add all remaining ingredients to a microwave-safe bowl. Whisk together and microwave until hot (about 2 minutes). Set aside. Once cook time is complete, allow pressure to release naturally (about 20 minutes). Using the trivet, transfer chicken to a large bowl and allow to cool slightly. Once cool enough to handle, remove all meat from bones. Add 1 cup of sauce to chicken and mix well. Add more sauce until your desired sauciness is reached.